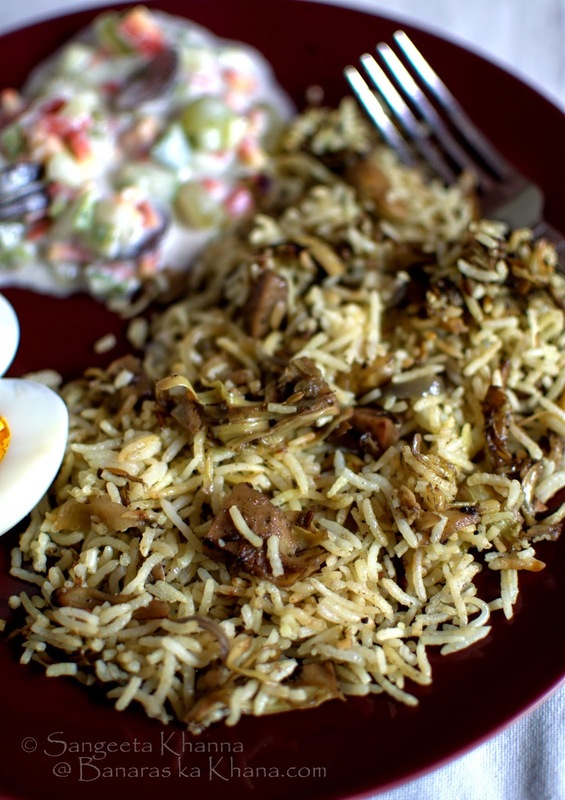 Kathal ki biryani is the ultimate vegetarian biryani that even I like. Normally the vegetarian biryanis are never impressive in any way, apart from being a mixed vegetables, nuts and rice cooked together. I prefer my khichdi over vegetarian Biryani. But Kathal or Jack fruit biryani is different. 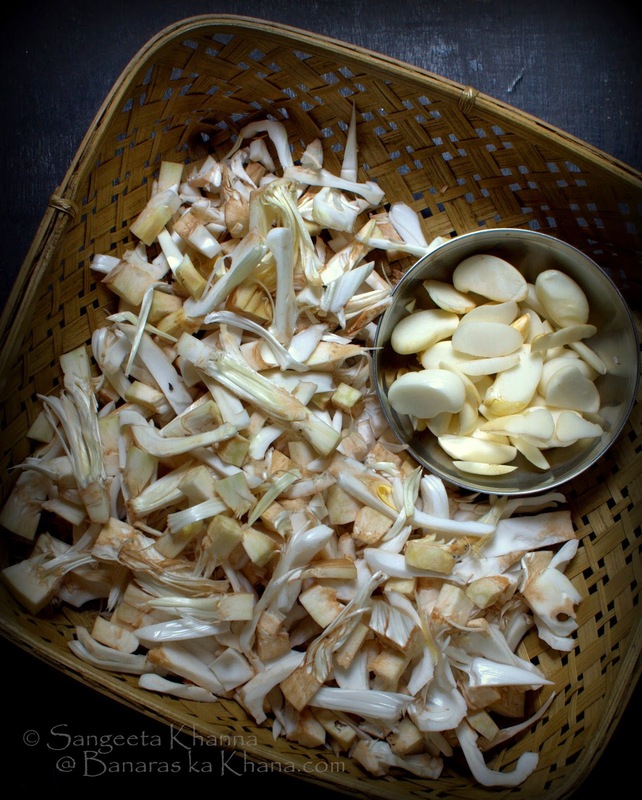 Raw jack fruit is a meat substitute for vegetarians all over India. 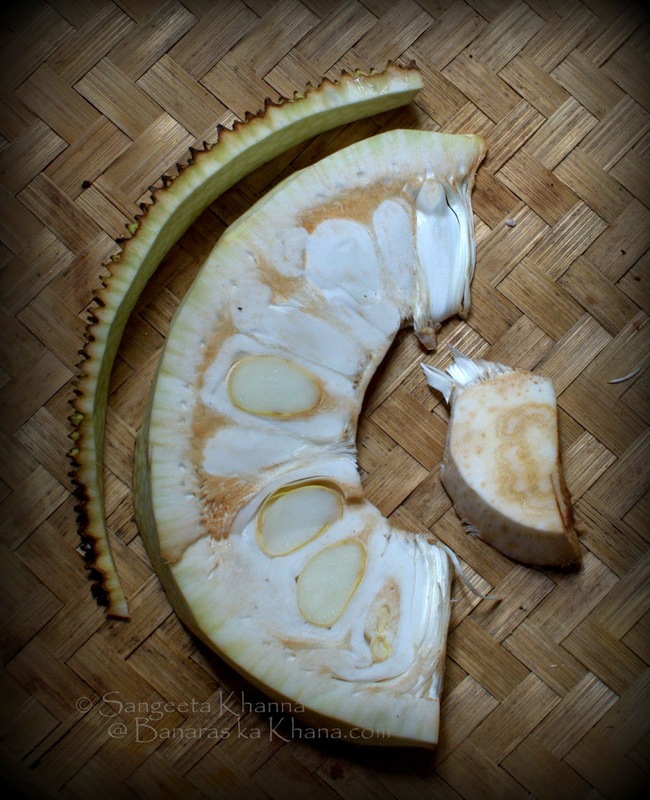 Kathal (jack fruit) was never a favourite vegetable when I was growing up. Just the kathal ka dopyaza was something I loved, sometimes the spicy versions of kathal ke kofte or a curry masquerading as mutton curry would be liked too. But I never really craved for kathal. So much so that I had cooked kathal only about 4 times in the last 6-7 years although it is available throughout the year. But then I saw a few kathal ki biryani recipes doing the rounds on fb groups and someone actually asked me to post my version of it. Now truth be told, I had never had any kathal ki biryani in my life. And this girl from Bangalore would keep requesting me to post more kathal recipes as she loved them and wanted to cook. I brought a whole kathal once and turned lazy in the coming week, made kathal ka dopyaza first as that is my first choice, the remaining kathal got wasted. Yes. Sad. But then as I kept thinking of kathal ki biryani, I picked up a fat slice of kathal on day from the subziwala and cleaned and chopped it almost immediately. Kathal ki biryani was planned for the next day, cooking was to be done early in the morning as I had planned to pack this 'biryani' to Arvind's lunch box as well. I thought it would taste like tahiri if not biryani and he anyway loves tahiri so it wont be a problem. I succeeded in making this kathal ki biryani in about 30 minutes, packed half of it for his lunch and half for myself. It was at my lunch time that I realised it actually was a good 'biryani'. Kathal is quite meaty and works well for biryani if treated well. Finally a biryani for vegetarians. I will tell you what do I mean by treating the kathal well. As I repeated the kathal ki biryani lunch box a few times and found out what way kathal tastes best in the biryani. Just take care to chop the kathal in shreds, separating the seeds (saving it for a curry if the seeds are mature) if the kathal has any. The one I used had very soft seeds so I let them be. 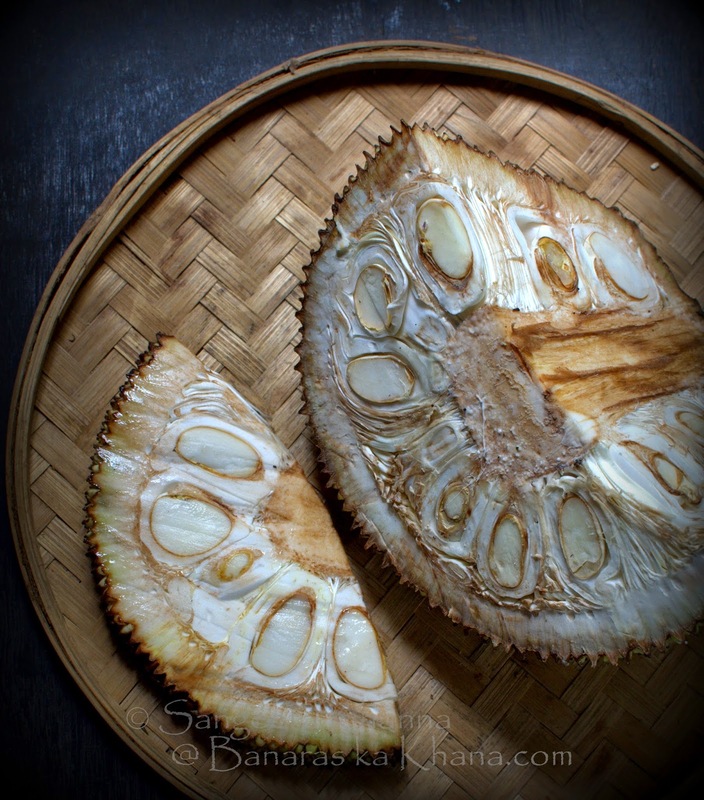 Remove the parchment like seed coat from each seed and reserve the fleshy and fibrous parts of the fruit. You would need to smear oil to your hands, the chopping board and the knife when you chop and peel kathal. Since I cooked this kathal ki biryani in the morning hurry hours, I worked out the shortest possible method for me. I am sure it would work for you too. As I mentioned I worked around a shortest possible method to cook this biryani, the fact that the kathal was chopped and refrigerated in advance helped. To make it quicker, I cooked the rice in microwave till the kathal was prepared in a pan of gas stove. Later both were mixed with light hand and microwaved again with a lid. This helped the rice look really separated and kathal stay meaty and not get mushy. Wash the rice, add water to it along with the tejpatta and patthar phool. These two spices bring the biryani flavours really well, making kathal ki biryani taste a bit like mutton biryani, although there is a wee hint only, but pleasing to the senses. Cook the rice in microwave as you would normally cook rice, but take it out as soon as the rice is 3/4th done. Cover and reserve. By the time rice cooks to this stage, you will be half done with the kathal on the pan. To prepare the kathal for biryani, heat ghee in a pan or kadhai and tip in the sliced onions, separated well so they fry nicely. Let the onions fry till they get golden brown. Take out half the onions and reserve, add whole spices, ginger julienne and chopped kathal to the remaining onions in the pan, one after the other, stirring in between. Add salt and cook covered for about 10 minutes, on low flame. Add the powdered spices, stir and mix well and cook covered till the kathal is done. Take about another 10 minutes. You might need to sprinkle some water during cooking as kathal may get dry and can get charred. Mix the cooked kathal and the 3/4th cooked rice. Cover and microwave for 5 minutes or till the rice looks fresh and done. Serve hot with raita and some salad. I had it with one boiled egg and and fruits and vegetable mix raita. These pictures are of my lunch that I had after 4 hours of cooking the biryani. Reheated kathal ki biryani tastes great too. i love kathal and to be precise, the kathal bhaji/sabzi we make with coconut and also the biryani. 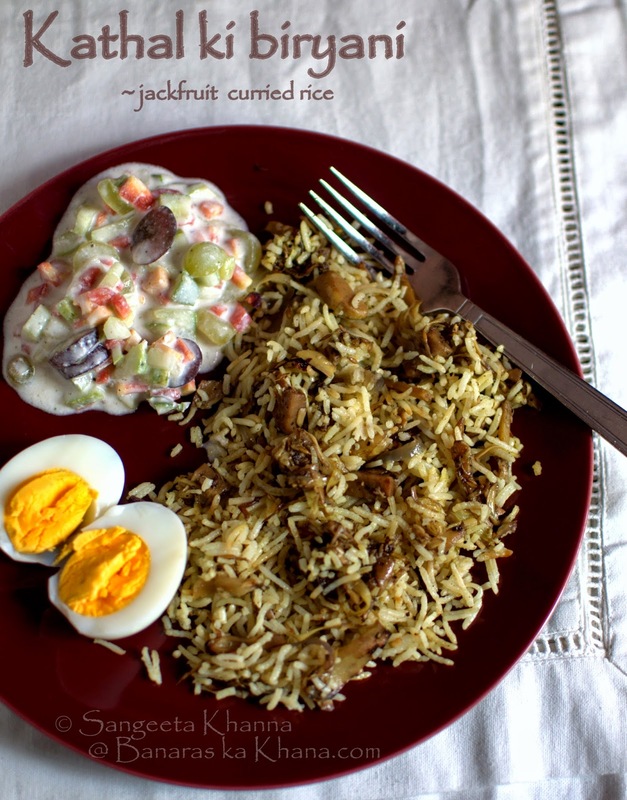 this is one of the easiest biryani recipe i have seen. I have been eyeing this one for ages. Hope I get the guts to cook it now. I tried the recipe today, turned out well....Thanks!! !